I learned to cook from my mother. She is the original inspiration for VintageAmanda. Mom is a country girl transplanted to the east coast with a bit of 1960’s organic/crunchiness about her. I grew up with homemade baby food, weekly bread baking, lots of playing in the woods and garden, and an endless supply of creative crafts and projects. Mom also has a big love of old things. At one point in my life (oh, between age 11 and 17) I thought this was just totally embarrassing, and that she should modernize things! Every summer we’d go back to my grandparent’s farm in Iowa, and come home with assorted old books, glass bottles, fabrics etc from the local fairs. I thought it was such a waste of time and energy when we could be doing fun things – like going to the Mall! (*Groan*) But everything comes full circle, doesn’t it? And now I wish I still had the chance to talk with my grandmother about her earlier life on the farm and sort through the treasures in the attic. 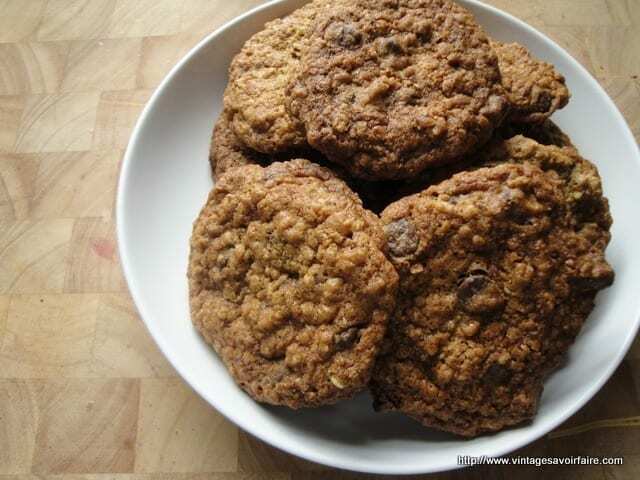 This recipe for Oatmeal Chocolate Chip Cookies is my Mom’s. It was the go-to cookie that we baked weekly. Some of the batch we’d eat right away, but the majority would go into the freezer. For some reason, eating these cookies frozen (yes, straight from the freezer) is SO good. So thanks, Mom, for implanting those first seeds of vintage fabulousness in me. Happy mother’s day! Preheat oven to 350. Cream/mix butter and sugar together until smooth. Add eggs, one at a time, and mix until incorporated. Add vanilla, baking soda and salt. Add oats and stir through. Add flour and stir until you can’t see it anymore. Finally, add chocolate chips and stir until evenly distributed. Scoop by big tablespoonfull onto cookie sheets. Bake 9-11 minutes, until golden brown and slightly puffy. Let cool before eating. Once cool, put some of the cookies in the freezer and eat once frozen. Trust me on this one! *Note: Today is Mother’s day in the UK … I’ll probably repost this one on US Mother’s day! Ok, so I decided to make some and I brought them at work, I received a “delicious, thank you” from my american boss, (yay! Sophie one point), and another collegue told me “they remind me of Amanda’s cookies”… I asked “really?? ?” I must have done something right ;)Thx Amanda! Hi Amanda, This receipe is for how many cookies roughly? Thanks, Amelia. About 32 cookies … really depends how big you make them! This recipe is SOOO good…Amanda used to bring these to work, and they’re amazing. Much more interesting than plain chocolate chip, plus, you get the added benefit of oatmeal. I, too, eat my cookies straight from the freezer — I think it makes the flavors better, especially the chocolate. I guess great minds think alike!